I, therefore, urge you to cast your vote on 12/19/2016 for Hillary Clinton, who won the national popular vote by a significant margin. If you are unable to see your way to do that, then I urge you to consider voting for the one leader who may clearly have bi-partisan support throughout our nation — Joseph Robinette “Joe” Biden Jr., our nation’s current Vice President. Thank you for your time and consideration, I appreciate and respect the role you serve in our electoral process. DISCLOSURE: By responding to this email you are waiving your right to any privacy or remedy. By responding to this email, for the consideration of me reading your email, you are giving consent for me to publish, disseminate, or otherwise distribute any information contained for any purposes I deem appropriate. If you do not consent to this condition, then do not reply. I am receiving about 4,000 emails a day so I have set this to an auto-response. You should know that I have no interest in Hillary Clinton becoming our next President. I reject the Democratic Party principles and I reject Hillary Clinton. I will not do anything that will open a path for HRC to become our next President. There is no such thing as a national popular vote. The only vote that matters to me as a Texas Elector is the Texas vote. We are not a democracy, we are a republic, for good cause. We all have differing opinions and I respect your part in the political process, but frankly, since I am a Texas elector, the political opinions of non-Texas voters means nothing to me. I do not vote or get involved in your state, I am not sure why you are trying to interfere in mine. As an American citizen, your voice should be able to be heard by all, so I have this email address available, but I owe no duty to any non-Texan. I encourage you to be active in the political process where your vote matters. Finally, I will not vote for a 3rd candidate. A 3rd candidate only opens the door for HRC to enter the White House through the House of Representatives. I will do nothing to enable HRC to become President of the United States, no matter how remote the chances are. Now that, my friends, is some serious partisanship. Clearly Mr. Kim is more willing to flush our nation down the toilet or hand it over to Vladimir Putin than to consider anything from anyone who doesn’t conform to the Republican mold of the way things need to be! If we want to take people like this out of our political process, then WE need to get off our butts and make that happen. 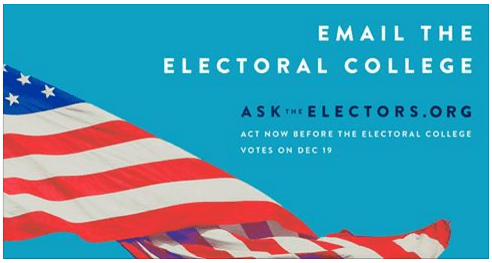 Electoral College Names: Who Are the Electors Who Will Vote for President? Heller would almost certainly be the GOP’s strongest candidate for governor, but he was fairly hostile to Trump all year, which has almost certainly pissed off a certain segment of Republican primary voters. That could inspire an opponent from the unabashedly racist wing of the party to throw up a roadblock for Heller if he ran for governor, something he likely wouldn’t face if he seeks another term in the Senate.